Gossip is a sin. Tolerating gossip is a sin. I have often been guilty of both. Gossip is one of the sins Christians have forgotten it is quite surprising considering how much the Bible has to say about gossip. Proverbs 18:8, Proverbs 20:19, Proverbs 17:4, Proverbs 6:16-19. “Christian gossip” just might be the worst because we give the justification that we are not gossiping, rather we are concerned about a brother or sister and we want to pray or discuss how to help the person in question. The verse christian gossips usually resort to to justify their behaviour is James 5:19-20 which essentially encourages us to turn those who wander away back so as to save them from death. The problem here is that if we are being honest, when we gossip or should I say ‘discuss’ or ‘share information’ about someone else to someone else, we rarely accomplish the goal of saving the sinner or backslider. Instead, if that person were to walk in on our conversation, he/she would feel shamed and embarrassed. Gossiping comes in many shades. Sometimes people do not even realise they are gossiping. Remember that listening to gossip is also sinful so there is nothing like ‘I was there when they said this and that but I did not contribute’. If you listened, you encouraged it. Proverbs 17:4. Today’s society craves gossip, we watch gossip on TV, we use our money to buy gossip news and tabloids. Slander: Spreading lies about someone to intentionally cause damage. Libel is the written form of slander. Colossians 3:8, James 4:11, Jeremiah 6:28, Jeremiah 9:4, Proverbs 11:13, Proverbs 20:19, Proverbs 26:20-22, Proverbs 10:18. Backbiting: Saying spiteful things abut someone who is not present, usually carried out in secret. Proverbs 25:23, Romans 1:28-32, 2 Corinthians 12:20, Psalm 101:5, Psalm 41:7, 1 Timothy 3:9-11, 1 Timothy 5:13-14, 2 Timothy 3:1-5, Titus 2:2-3.
we are to lay aside all manner of evil speaking. 1 Peter 2:1, Titus 3:2. Pamela Rose Williams has often quoted her husband as saying “If you aren’t part of the problem or the solution, its gossip”. Gossip has ruined office relationships, churches, friendships and even family relationships. Proverbs 17:9. Other words the Bible uses in reference to gossip are: tale bearing, busybody and whispering. Other verses to further study: Ephesians 4:29, Proverbs 16:28, Exodus 23:1, Psalm 34:13, James 1:26, Luke 6:31, Proverbs 10:18, Leviticus 19:16, Psalm 50:19-23, James 3:7-8, Titus 3:10, Proverbs 18:13, 2 Timothy 3:23, Titus 3:9, Psalm 19:14, 2 Timothy 2:16. This is one of those verses that people do not like. Especially the first sentence. Well, as individuals, we are responsible to God for our own sin. Blaming others for our wrongful doing is very easy, but how about a little self evaluation??? We need to admit our sins and repent from them! God’s grace is ever sufficient but ultimately, we need to own up to our sin and pursue righteous living. Even if you are a Pastor’s kid, your parents’ salvation is THEIR salvation. 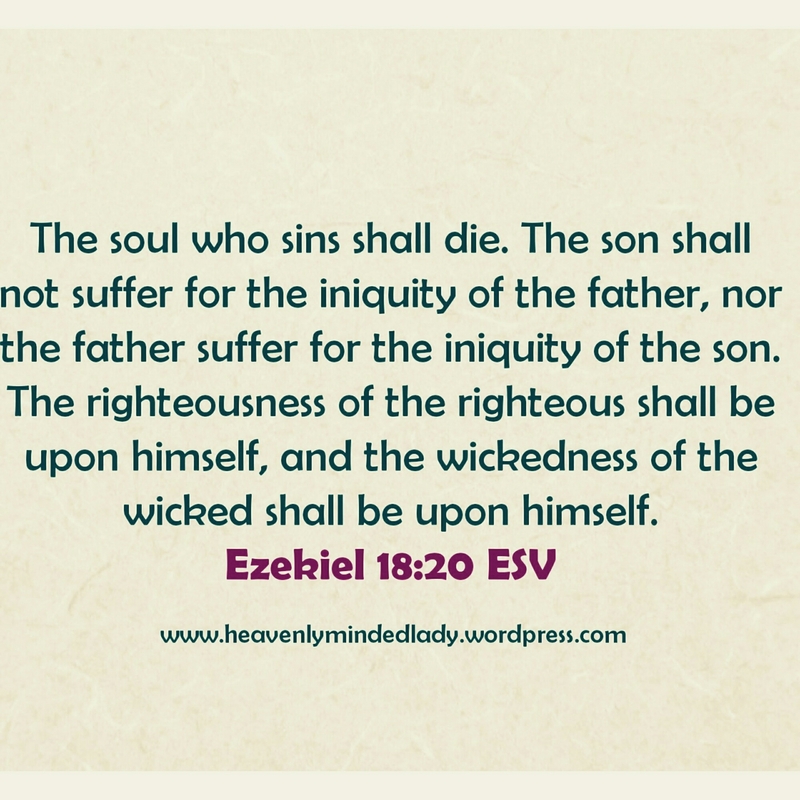 There is no free ticket to heaven just because your mother or father is righteous. Each person has to work out their own salvation!!! When I saw this picture on Instagram yesterday, I literally giggled. It is so interesting how the blessings of God are emphasized (underlined and highlighted) whereas the part about ‘honouring’ God does not seem important enough to be highlighted. Why do we want to claim God’s promises without living for God? It is like having a friend or family member who always wants to collect from you but never ever wants to give or be there for you at all. God is not to be used! God is to be worshipped, reverenced and honoured. The best way to live for God is to make him a priority in our lives. Basically, EVERYTHING we do should honour God. How we live on a daily basis (Our lifestyle) should honour God. Honouring God in everything includes: Our dressing, finances, hobbies, occupations, businesses, bodies, music, speech etc. As Christians we need to realise that honouring God is not limited to our words or good intentions. Talk is cheap, completely honouring God with our lives is not easy but it is very well worth it.